Crockett Dumas' endurance mare OT Sara Moniet will be one of the new 2014 Breyer horse models. Winner of the 2011 awards Arabian Horses Association (AHA) Distance Horse of the Year, AERC Distance Horse of the Year, and the Institute for the Desert Arabian Horses Drinkers of the Wind Challenge Champion, OT Sara Moniet had an outstanding 2011 record of 31 starts and completions and 1675 miles, with 2 100-mile completions and 9 Best Condition Awards. The 9-year-old mare currently has 4355 miles with 83 completions in 86 starts, with 16 overall Best Conditions. Join us for a great day of golf as we support our beloved trail and the efforts in rebuilding after this summer's fire. Closest to the pin, Putting, Raffle and more! Lunch and Dinner with No Host Bar after the Round. Please donate on our website, www.teviscup.org. You will see a button that says DONATE on the left sidebar. All Bonnie Davis wanted to do was spend some time horseback riding with her friend, Jackie Hunt. Now she’s spending her time planning a fundraiser to help pay for her friend’s hospital bills. The fundraising event called “Ride for Jackie” will take place on Sunday, Oct. 13 from 10 a.m. to 4 p.m. at the Sky River Equestrian Center located in Sultan. The event will include an obstacle course, hot lunch, silent auction and raffle. Hunt, who fell from her horse in September after an encounter with two motorcycle riders, suffered a traumatic brain injury as a result of the fall. All proceeds from the benefit will go towards Hunt’s medical bills which include the cost of the aid car, two trips to the emergency room, and her follow-up medical care. “She’s discovering, every day, things that are challenges that weren’t before,” said Davis. On Sunday Sept. 8, Davis, who lives in Monroe, was riding through the Mann Road trails in Sultan with her friend, Hunt. They were just getting ready to call it a day when they encountered two motorcycle riders. The encounter, while unexpected, did not immediately cause alarm to either Davis or Hunt. They occasionally encounter motorized vehicles on the local trail systems, and normally have no issues at all with the local off-road vehicle community. The confrontation was unexpected because the Mann Road trails are located on 50,000 acres of privately managed timberland on which motor vehicles are prohibited. The management firm has granted conservation access which allows horseback riding, dog walking, backpacking, walking, bicyclists and legal hunting. UPPER MERION — Veterans, citizens, Democrats and Republicans all came together Sunday to protest the government shutdown at Valley Forge National Historical Park. Close to 1,000 protestors rallied outside of the Washington Memorial Chapel before marching on the closed trails. Protestors disobeyed instructions posted throughout the federal park, warning visitors that facilities were closed to the public. Cars were parked on the grassy shoulders of Valley Forge Road, in nearby commercial parking lots or in the park’s caution-taped lots at the risk of a fine. Carpools were organized on the protest’s Facebook page. On October 13, 2013, endurance riders Amy Carlson-Cieri, Skip Kemerer, Pat Jones Oliva, Shelley Hylton Rahe, Sam Wilcox, and Sarah Wood, participated in a peaceful act of civil disobedience. The Veterans March on Valley Forge National Park was organized to protest the closure of our National Parks due to the government shutdown. The march included veterans, people in wheelchairs, individuals walking barefoot to honor the soldiers who had died in Valley Forge and numerous everyday Americans who are nonpartisan and just fed up with useless government infringement upon our rights. The horses led the march from the historic Valley Forge Chapel, one mile to the visitor’s center. The Sons of Liberty Motor Cycle Riders rode slowly next to the horses on the street, while the horses led the people along Valley Forge's grassy path. When the entrance came into sight, the Sons of Liberty rode ahead and piled the temporary barriers off to the side so the horses could walk right in. Skip Kemerer and Pat Oliva, followed by the other riders and Patriots approached the locked gate to the park access road. A park ranger stood in between them. Skip and Pat quietly walked to either side of the locked gate and entered the park with no opposition from the ranger. The Patriots cheered and someone shouted, "Valley Forge Park is now OPEN!" People started streaming into the park from all sides! We filed down to the Visitors center and the organizers raised the American flag on the center pole and a Gadsden flag on another. The rally was peaceful and the message clear! How Will the Government Shutdown Affect Equine Interests? As of midnight on Oct. 1 all employees deemed nonessential by the federal government were furloughed without pay. In fact, Congress has failed to pass any of the annual appropriation bills that fund government agencies and projects for the fiscal year that runs today through Sept. 30, 2014. What does this mean for your horse-industry activities? ANNE AYALA JUNIOR SCHOLARSHIP: Juniors and young riders through age 21 are invited to apply for the 2014 junior scholarship. Applications are due by 1/8/14. Information/application is available here. As the federal government shut down hits its second week, a weekend of fun turned into panic for Anne Liddell and her horses. The Alabama Yellowhammer Pioneer Endurance Ride is a popular event for horse enthusiasts that takes place each year at the Talladega National Forest. This year, the event was shortened because of the government shutdown, and riders and their horses were kicked out of the park late in the evening, potentially putting them in danger. To Liddell, horses are family. She's been riding since she was a child, but she's never experienced anything like she did last weekend at the endurance ride. "Around about 8 o'clock on Friday evening, we were told there were law enforcement people on their way and we needed to pack up and leave," she said. Idaho Department of Fish and Game advises Idaho hunters, anglers, trappers, and wildlife watchers of the following information about federal land closures related to the federal government shutdown. Idaho Fish and Game is not authorized to enforce these federal closures. Idaho Fish and Game does not have information beyond that provided by federal press releases and through the www.usa.gov website. Fish and Wildlife Service: National Wildlife Refuge lands and facilities are closed to public access as are federal hatcheries. Bureau of Land Management: Non-developed BLM lands with no controlled access will remain open. Campgrounds, boat ramps, visitor centers and other developed recreation sites will be closed or posted as closed in areas where public access cannot practically be restricted. BLM is giving campground occupants 48 hours to vacate, with the area shut down as the last visitor leaves. U.S. Forest Service: Non-developed lands without controlled access will remain open. Developed facilities are closed. Fire suppression, law enforcement and other activities essential to protect life and property will continue. National Park Service: All national parks and NPS-managed lands are closed, with all park entrances closed and secured. While the national parks are closed, roads that serve as thruways will remain open. The Park Service is giving campground and lodging occupants 48 hours to vacate the premises. U.S. Bureau of Reclamation: Recreation areas located on Reclamation land and water bodies may be directly managed by Reclamation, by another Federal agency, or by a non-Federal managing partner. Recreation areas managed directly by Reclamation, and which are funded through appropriations, will be closed and may include areas at American Falls, Black Canyon Reservoir, Little Wood Reservoir and Warm Springs Reservoir. Those which are not funded by appropriations will remain open. Decisions on whether areas managed by another Federal partner will remain open will be made by each Federal managing partner. Those recreation areas managed by a non-Federal partner will remain open at the discretion of the partner. To determine the status of any Bureau of Reclamation recreation area, please contact the local recreation area. Phoenix endurance rider Kim Abbott loves the annual Man Against Horse Race in Dewey. She should - she has won it twice and placed in the top 10 several times. This Saturday, she'll be looking to wrest a third win from runners and horse/rider teams in the 50-mile race over Mingus Mountain and back. The Man Against Horse Race, in its 30th year, and the Whiskey Row Marathon are the two longest running races in Arizona. The late runner and former Yavapai County Supervisor Gheral Brownlow started both. 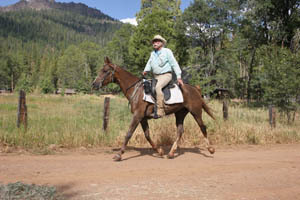 CEDAR CITY — The second annual Quichipa Lake Ride for the Cure brought endurance horseback riders from throughout the West to Iron County to ride 25 or 50 miles Friday and Saturday, with the proceeds from registration fees going to the Sandra L. Maxwell Cancer Center. Ride Manager Gwen Farmer, who has gone through cancer treatment herself, said she was able to give the center a check for $1,000 last year and hopes to be able to give a similar amount this year. She said 15 riders, both 25- and 50-milers, participated in this year’s ride, with some of them riding both days. One hundred miles. In one day. It’s the ultimate goal for aspiring distance riders and this month, the American Endurance Ride Conference honors 55 equine that recently finished their first 100-mile ride. An additional 22 equines completed their third 100-mile ride. Earning the highest honor was TR Notablymishaah, owned and ridden by Debbie Schultz of Harleysville, PA, a 12-year-old Arabian gelding who has completed 20 100-mile rides. With 15 100-mile rides were Hot Desert Knight, a 13-year-old Arabian owned and ridden by Farzad Faryadi of Oakboro, NC, and Fourmiles Kuna, an 18-year-old Arabian/Appaloosa gelding owned and ridden by 19-year-old Meghan Delp of Westminster, Maryland. Three other equines made the gold level with 10 100s: Jumpin’ Jax, owned by Ruth Anne Everett of North Carolina, Theatric, owned by Tom Hutchinson of Maine and Tiki Chaps Ku, owned by Gabrielle Mann of Northern California. Two other Northern Californians had horses reaching the silver level, with seven 100s: Nicole Chappell’s Golden Knight and Robert Ribley’s Sacajawea. The American Endurance Ride Conference welcomes riders in all distances, from introductory rides of 10 miles to 100s and multiday rides, where riders travel at least 50 miles a day over three or more days. The organization’s 2014 ride season begins December 1, 2013. Van Jacobsen has completed several endurance races before, from a distance ranging from 50 to 100 miles. But all of them have come while riding on a horse. He is endorsed by the American Endurance Ride Conference, which sponsors these types of races. Sunday he will attempt another endurance test, but this time with no horse; it will be on foot. The 58-year-old Jacobsen will be at the starting line for the 34th annual Twin Cities Marathon, which is his first running venture at 26.2 miles. "If you had told me a few years ago that I would be running a marathon, I would have said absolutely not," he said. "But here I am...'"
Ann Hall of Auburn, California, took home her 7th buckle (in 8 attempts), and her mount HCC Zara RR completed her 2nd Top Ten finish (in as many starts), and received the Best Condition award at the 46th annual Virginia City 100 on September 21, 2013, in Virginia City, Nevada. The Virginia City 100 was a competitive ride this year, with winners Nicole Chappell riding Golden Knight, and Diane Stevens riding Banderaz LC tying for first place, finishing 20 minutes ahead of a crowd of horses: the next 6 finishers were within 6 minutes of each other. "Zara" was one of those, in 5th place. "We came into the last vet check, the Cottonwoods, with 4 other riders," Ann said. "Zara recovered immediately and had a strong finish; she covered the last 9 miles in 45 minutes. At this point, she is getting stronger and consistently has a big push the last 10 miles of the ride." The desert endurance riders experienced every kind of weather during the ride, except for summer. "The early morning ride was beautiful with a spirited breeze and a bright moon making the traverse through the dark 7-mile canyon lovely," Ann recalled. "By the mid afternoon we had strong winds, then strong rain, and by the time riders were climbing Mount Davidson they were riding in snow. Once the weather front had spent itself, the skies cleared and riders had a brisk clear night ride." The Hyannis Cattle Company-bred 12-year-old mare HCC Zara RR now has 1935 miles in her 5-year endurance career, with 30 completions in 31 starts, 7 hundred mile completions in 7 starts, and 4 Best Condition awards. 36 of 49 riders finished this year's VC 100, 19 of them for the first time. 3 Juniors started and finished. Connie Creech received her 22nd VC 100 buckle, and Nicole Chappell received her 21st buckle. Horse and rider team Gina Hall and Fire Mt. Destiny for the 9th time.